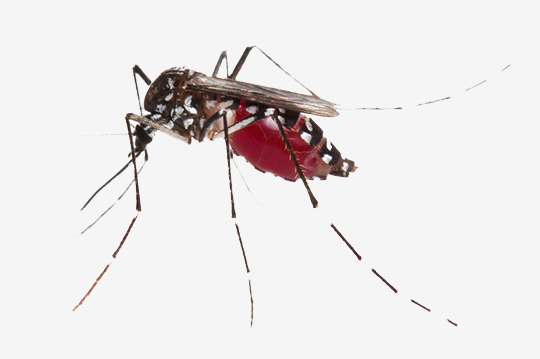 Mosquito Control Canton, GA | Bug-Off Exterminators, Inc.
Mosquito control requires an approach that targets mosquitoes in all phases of their life: adults, larvae, pupa, and eggs. A residual insecticide needs to be applied around the yard and surrounding areas to shrubbery, tall grasses, low tree branches, flower beds, and shaded areas. Larvicides can be used in places where larvae are found to eliminate them before they become adults. Control measures like keeping weeds trimmed to remove resting places for mosquitoes and removing standing water to reduce breeding grounds are also important. All of our pest control technicians are registered professionals who regularly perform mosquito control services in Canton, Georgia. Our experts have experience working in a variety of situations around houses and businesses, they have the knowledge and experience necessary to help control mosquitoes around your property. They will work with you to create a mosquito control program that will allow you to enjoy being outside in your yard. Summer is a time to take advantage of the warmer weather and longer days by enjoying a variety of outdoor activities, such as swimming, camping, hiking, and grilling. Backyard barbecues are an ideal way to enjoy the long summer evenings and relax with friends and family; that is, until mosquitoes crash the party. Mosquitoes love the hot weather of summer and breed in even small areas of standing water. Left unchecked, they can quickly increase in number and become a real nuisance at any outdoor event. To protect your family and regain control of your yard, or to actively prevent mosquitoes from taking over in the first place, it is a good idea to seek out professional help. Our service includes the mosquito trap which will continue to kill the next generation of mosquitoes before they become adults. As well as the misting spray which will kill current adult mosquiotes. During a service visit, one of our technicians will inspect your property for potential problem areas to identify breeding grounds. A mosquito control program is recommended to address current problems and provide suggestions for future prevention. This can include advising that items that collect water, such as old tires, be removed in an effort to eliminate eggs before they hatch. Bird baths and other areas that can hold water should also be inspected and cleaned. They can also offer advice about controlling larvae so they do not become adults. 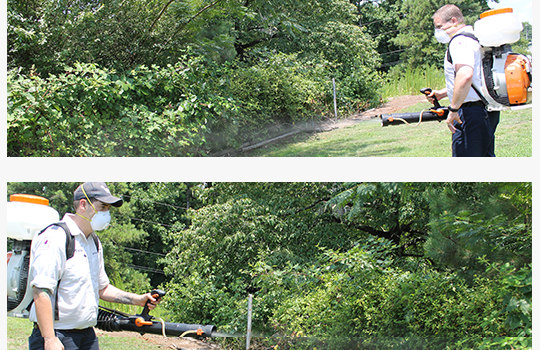 The technician then begins treatment by using a leaf blower backpack sprayer to apply residual insecticide in areas where mosquitoes congregate. Your grass will not be sprayed and the insecticide does not harm the plants. By walking around the property and spraying areas of tall grass and shrubbery, the technician will provide a thorough treatment. It is best to have this service performed monthly because the insecticide will break down due to weather conditions. In addition, mosquito traps can be placed around your property to help control the eggs and larva before they become adults. Keep mosquitoes from ruining your summer by contacting us as soon as you start noticing the pests. Our expert technicians are trained to provide mosquito treatment solutions; let us help you enjoy your backyard all summer long.